“Treguern, three times dead, will be resurrected. 1800, On the windswept moors of Brittany, renegade priest Gabriel Le Brec and Fihol de Treguern embark on a scheme to defraud an insurance company by faking the death of the latter. This sets in motion a danse macabre of murders, betrayals, people who change their names, lost birth certificates, false testimonies an Ann Radcliffe romance, a Miltonian struggle between Good and Evil and an impossible phantasmagoria of living men who pretend to be dead and dead men who return to claim vengeance. The Mention: This is a novel, originally printed piecemeal in 1852, by French author Paul Féval, who is a favourite of Taliesin Meets the Vampires. 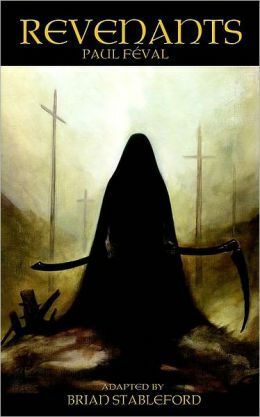 Other works by Féval that we have looked at are The Vampire Countess, Knightshade and Vampire City . Now, all those books had (at least the belief in) vampires. Revenants are the restless dead. Arguably they are another form of vampire (or the vampire is a sub-group of revenant), however the primary trait of the vampire (from the 18th century Vampire Panics) was the sucking of blood – an assumption as many of the attacks actually focused on asphyxiation but the presence of blood at the mouth etcetera, when the vampire was exhumed, was taken as proof of blood drinking. Conversely revenant myths would often not mention blood drinking (though there are exceptions where blood is mentioned in myth). In this case the revenant seems to be simply restless dead, indeed the first occurrence in text is actually one who was still alive but had faked his death. Later in the book (as the time frame jumps to the 1820s) there are several revenants who may be fakes or may be the restless dead. Translator Brian Stableford, in his notes, suggests that there is only one instance of a definitely (or probably) real revenant. The revenant aspect might be of genre interest enough to earn a honourable mention in its own right. However vampires are mentioned in passing as well. Commander Malo, a warrior priest, is said to be familiar with vampires from Poland, Hungary, Moravia and Silesia. Also interesting is a discussion about the play The Vampire, referring to the play by Nodier based on Polidori’s The Vampyre. It was a runaway success in 1820, as the story suggests, but Stableford points out that it was having revived success in 1852 too. The character Gabriel de Feuillans is likened in text to the vampire of the play. In truth he is a man who will kill for money, rather than blood. I enjoyed the book, despite some holes born out of the piecemeal writing style, and it deserves to be looked at as, at least, something of genre interest. I love this books and all Feval's stuff and highly recommend them. For modern readers I'd recommend starting with Knightshade and The Vampire Countess, those are shorter novels, and have the least of Feval's narrative excess that might turn off modern reader. But his master works are John Devil and The Blackcoats. The Blackcoats may also make passing references to Vampires if I recall, when dealing with the alleged immortality of The Colonel. I like how Stableford talks about the moral Ambiguity of this book. That Feval may not have intended. This is a books where Feval's fervent Catholicism and Royalist politics really shows. Hi... the catholicism really comes out through the edition that Stabelford translated as it was, as you know, the version Feval ammended to take account of his rekindled faith. He was always Catholic, his Conversion was just a Reversion. I apologize for missing that. My point was I don't think the revision actually changes anything that wasn't purely superficial. The issue I refereed to is that the Protagonists of the story really aren't morally superior to the villains. I also highly recommend the Empire of the necromancers trilogy, which I mentioned before. It draws on this and The Vampire Countess.